“KB, how’s the trail today?”, I inquired. KB, looked at us and pointed his index finger upwards, with a smile. “What, it’s vertical?”. “No, not vertical but it’s up, and up and up, then flat, then down and then up again”. This exchange would become our trademarked style of communicating every morning, I realised later. Us asking him with lot of expectation and KB using his hand gestures to indicate the gradient and difficulty of the terrain. This was always followed by an amused giggle by both Varun and I, knowing that we’d have to mentally gear up to face the terrain. And so it was even that morning of April 5th. We stepped out on the trail and looked at the path ahead. The horizon had opened up considerably. No longer was there the haze we had seen the morning before. Blue skies and sparse clouds dominated the palate. The mountains for the first time looked huge. Dotted with green they were from the bottom till the mid. The top faces were barren and brown. The morning sun had broken through too. And there was a gentle breeze that ran through us and also made the leaves flutter. What a wonderful day to be in the outdoors, I thought. With optimism in my heart and mind and a song on my lips, I commenced the long walk that lay before me. 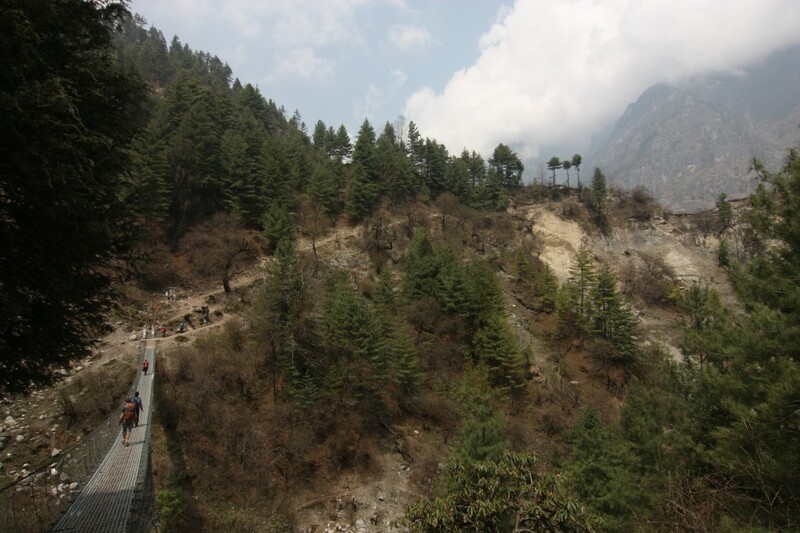 We were in western Nepal, in Manang District, one of the 75 districts in the country. The district roughly covered a geographical land area of a little more than 2000 sq kms. The place we were heading to was Chame, (2670 mtrs/ 8758 ft) the district headquarters. Manang was also connected to the famous Mustang district, bordering the Tibetan highlands via the formidable Thorung La (5416 mtrs/ 17765 ft). 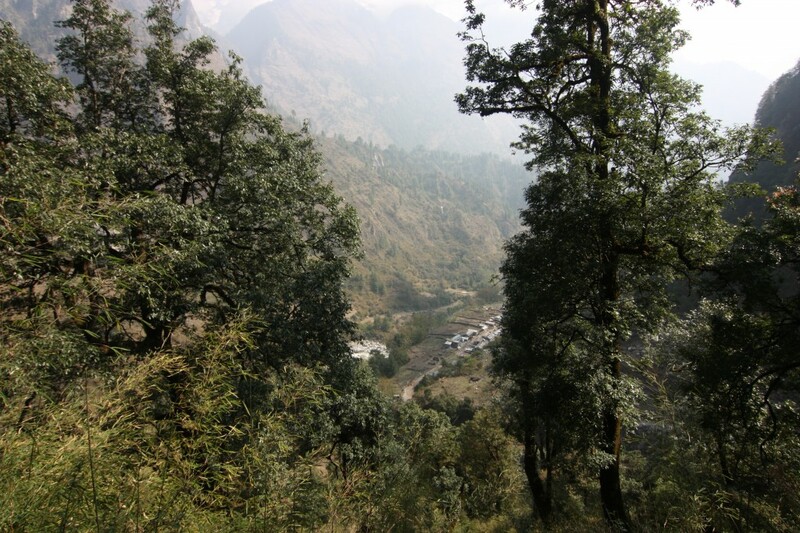 These areas were barren, desolate and harsh as compared to the thick vegetation and mountain cover found in Eastern Nepal. A few stretches to limber up and get the blood flowing in the limbs again, helped. An hour into the morning and I was walking past apple plantations, mountain streams and waterfalls and soon forests of pine and fir. The morning had a sense of calm and serenity to it. The birds chirped away joyfully as well, keeping me company as I walked. KB and Varun were ahead and leading the way. I was slow off the starting blocks and deliberately so. I was a bit relaxed and taking in my surroundings. Very soon I knew this ease would cease and the hard toil would commence. And sure enough it did, sooner than I had expected it to. 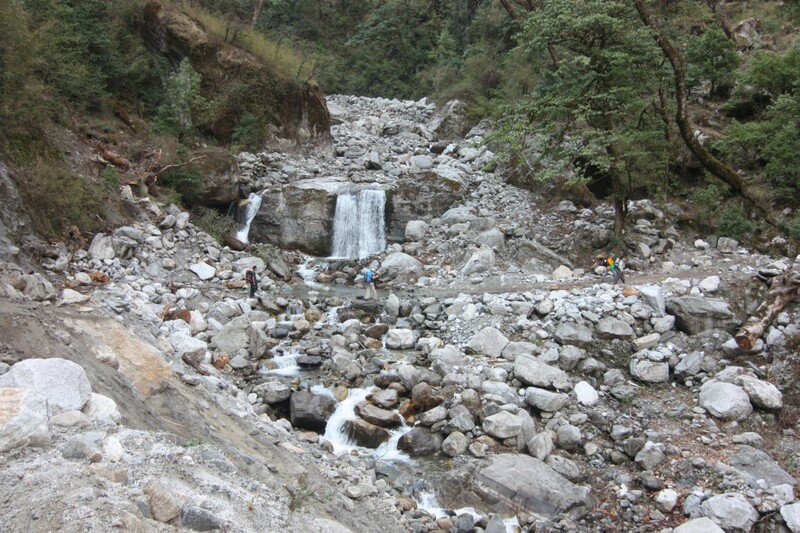 The gradient from Dharapani to Timang (2750 mtrs/ 9020 ft) was the steepest on the Annapurna trail overall. At certain stretches it was a 70 degree incline. We walked over giant steps which had been cut through as well as naturally formed paths. Not only was this a back breaker, but the thighs took an equal strain too. I could feel the muscles go taut with each step. Every time this happened I remembered the mornings spent at the gym doing leg curls and working the quadriceps and the hamstrings. Now on the trail, this is where that preparation mattered the most. 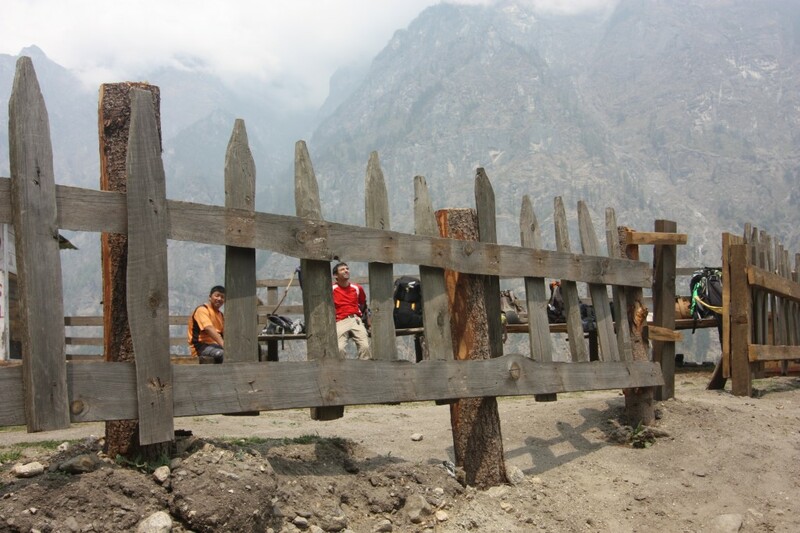 Timang was our midway halt for a much needed breather. The 14 kg backpack meantime was turning out to be a mini adventure in itself. It did slow me down considerably as I climbed. But this was a big turn on for me to see it through. Varun had chided me earlier and questioned my motivations. 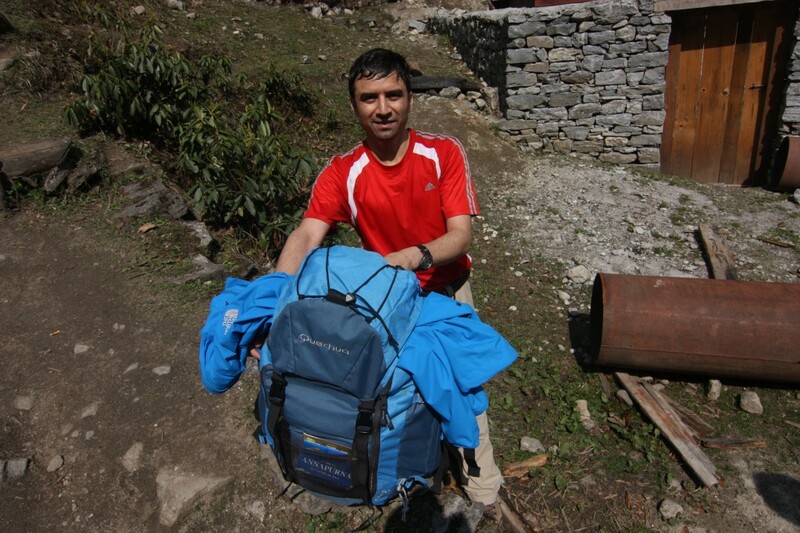 Why would I consider doing this when we had Lakhpa to carry the load? Besides weren’t we also paying him for it? I had smiled then and had continued doing what I was. The breaks on the climb were more than I had anticipated I would take. The 2 litre hydration pack was put to good use, as I sipped away generous gulps of water. The energy and chocolate bars were also munched into. Not ‘coz I had depleting levels of stamina; it was more to fool the mind and distract it from the physical ordeal as I kept walking. Besides the cadbury 5 star bars always tasted better in the mountains now didn’t they? 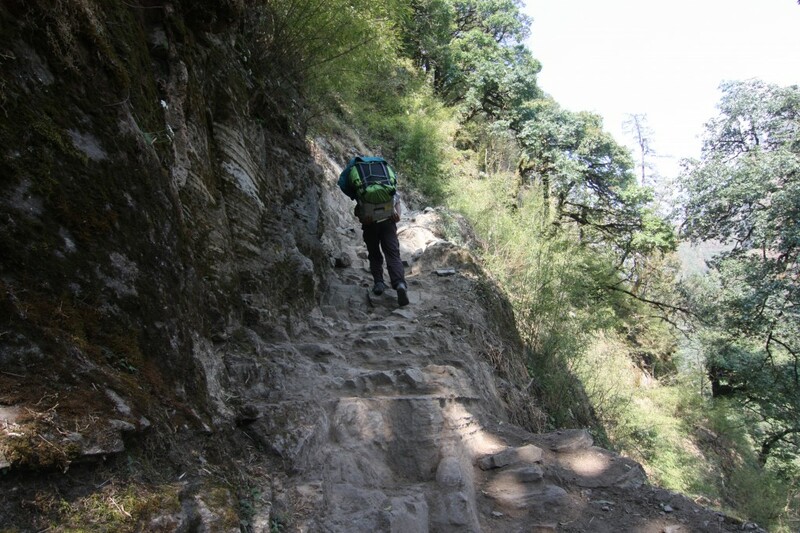 While the trail from Syange to Dharapani was a gentle trail breaker on Day 1 of actual walking, comparatively Dharapani to Timang was several notches higher. Two different trails of varying character on two separate days. One couldn’t help wonder if this was intentional by those who had first chalked out the route to Annapurna. Whatever the reasons, physically it was to our advantage. By the time we would near Thorung La, we would be in prime condition to tackle whatever came our way. And then later, Annapurna Base Camp would be a breeze. One step at a time till I counted one hundred and then stopping to catch my breath again for a minute or two was the general routine I set myself till I reached Timang. Sitting down to rest was not an option. In the mountains, in the trail you never sit down. If you do, you’d never want to get up. So the best option was to stand, look at the mountains, the peaks, the habitations we had left behind, below us, get the camera and frame the picturesque settings and more importantly get that breather. 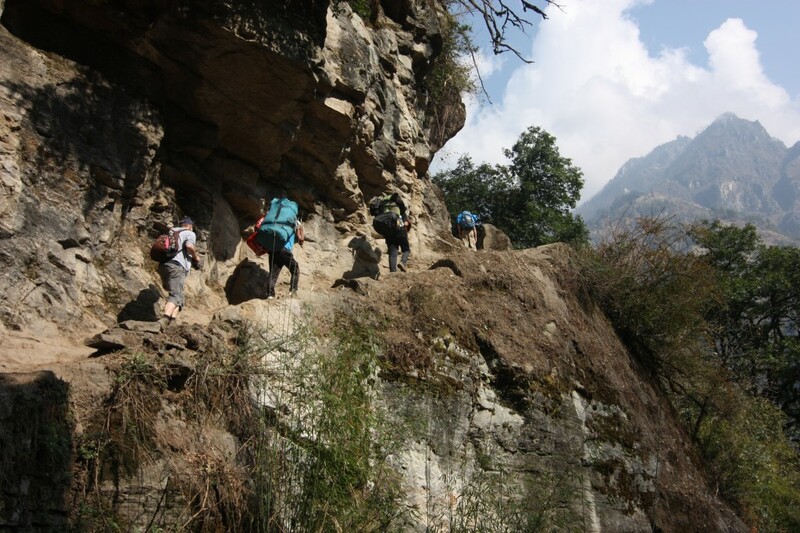 While doing this, I had to give way to the many load bearing Sherpa porters, guides and teams. There was a continuous stream in batches who went past. I had lost sight of Varun and KB too. They were ahead. Somewhere. Hopefully fine and managing. Time to take a breather & ask yourself, hell did I climb so much?! We all met at the Timang campsite at approximately a little over 11:00 hours. I was the last to arrive, close on the heels of Varun. It had been a gruelling 3.5 hours of leg and lower back workout. The mountains were the outdoor gym we had registered for. Resting my backpack on the wooden bench, at the makeshift thatched hut serving refreshments, I took deep breaths to clear my mind and relax. The lungs felt young and light, the body supple and it felt great to sweat. I still didn’t sit but reclined. Hot lemon was ordered. But I craved some cookies. I looked at the glass counters to see what was available and spotted a childhood favourite which once used to retail in India – Coconut Crunchees. The cookies were wonderful and each bite brought back sweet memories. I savoured every munch and wondered why they weren’t made anymore back home? I fondly recollected the adverts which were telecast in the late 80s and early 90s. As the body cooled down, the wind draft cutting through this high campsite made me shiver. Another hot lemon was called for as I reached and pulled out the trail map from the side pockets of the backpack. “Varun and KB, Koto (2600 mtrs/ 8528 ft) seems to be a good place to halt for lunch. Chame will be another 1.5 hours from there I reckon”. They both agreed we should halt at Koto. A descent was good news too. I could now cover ground faster. It was soon time for us to move. As was the established norm by now, Lakhpa had already made his way out of the campsite 15 minutes before we decided we should. The thick forests of pine and fir continued. Shaded stretches mixed with ones lit in bright sunshine lay before us. The mud path was strewn with pine cones. I could see Varun ahead, stopping many times to pick and stuff them into his day bag. They were for Vidur and Vidhi he told me. “They’ll love playing with them. Why don’t you pick some for Shayon too?”. I helped him pick up some ripe ones for his children instead. Before the descent, another ascent…. After a brief halt at Koto for lunch, we were on our way again. The map indicated we would soon reach the white gates of Chame. Wow, I thought, very regal like, and imperial sounding. It sounded similar to the white city of Gondor. 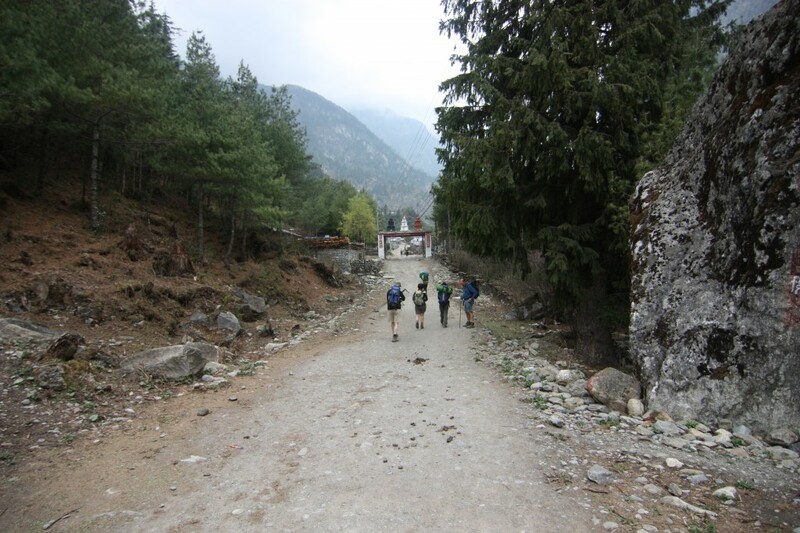 We reached Chame at 5 pm, after having walked for another 8.5 hours for the second successive day. We checked into our small 6 x 6 ft room. After dropping the bags, the first thing we did was to grab the NCell network. There was a NCell tower in the vicinity, I was told. After trying multiple times a single bar, followed by two others appeared. Phew! I had missed my phone, the data plan and staying connected with family. It was time to call home and also log into the social network. Later I sent a mail to group 2 in India, who were excitedly awaiting details from us. They were raring to commence their own adventure to Base Camp Annapurna and were scheduled to fly out of India on April 9th. 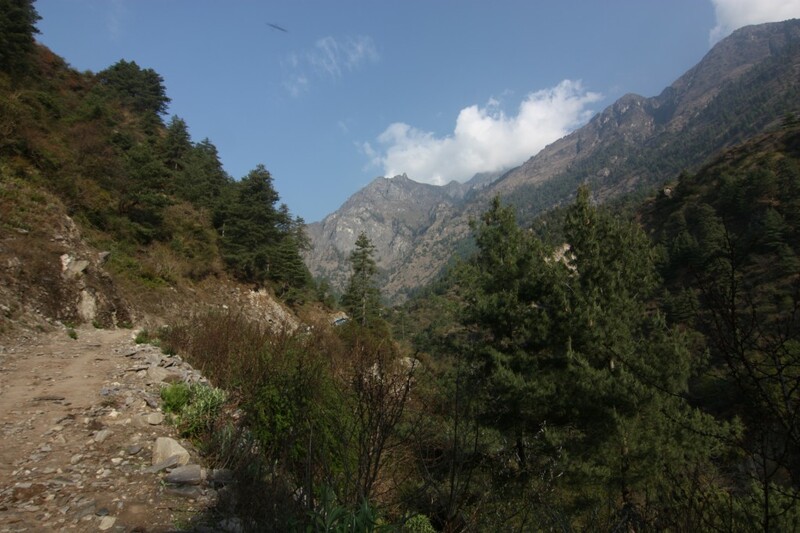 Each day spent in India was an ordeal and the fact that we were already walking the mountains didn’t help them at all. Here’s the update for April 3rd and 4th. We reached Syange safely in a bus drive, that took forever, on roads I have never seen before and a ride that I have never experienced before. The night at Syange was peaceful however. We weren’t quite sure of what to expect the next day. Our guides weren’t either (reference is us). In short we outdid ourselves. We went ahead of the itinerary and scheduled stop ‘coz we were early at the designated halt for the day. So after a sumptuous lunch at Tal, we proceeded to Dharapani. On the first day of the trek we walked 8.5 hours. Total 9.5 hours with an hour for lunch. It felt so good! But it took a toll on me. My shoulders cramped up and started freezing. At night I had a combiflam and sprayed deep heat. This worked wonders. This morning I woke up with no pain. Remember to carry them. By the way I have been lugging the backpack which weighs 14 kgs. No wonder the cramps. The guides now knew our speed of walking. So we are one day ahead of the itinerary and plan to use the extra day at Muktinath. We are at Chame now. It’s been a back breaking day. 2nd day on the trot. We climbed 2500 feet from 6500 feet in 3.5 hours. It was an almost vertical climb! At places it was almost 70 degrees. We had to go slow. One step at a time. Tiring but fun. And a small achievement at the end of it. These are the joys of trekking. It’s raining in Chame now. And if it continues this way the night will be cold. Hope it’s bright and sunny tomorrow. Please buy the Nepal Telecom sim card and not Ncell. Ncell doesn’t work in the mountains. Nepal Telecom will. We have got a signal after 2 days. And won’t get one till we cross Thorung La. One last point. Start Diamox from the morning you leave Pokhara. I am sure everyone can manage Kathmandu and Pokhara. PS: The rain increases in intensity even as I write this. Damn! : ) Bring it on! This entry was posted in Events, Latest Journey and tagged Chame, Coconut Crunchees, Diamox, Manang, Mountains, Mustang, N Cell, Nepal, Nepal Telecom, Tibet. Bookmark the permalink.